Welcome to a 'perfect' world. 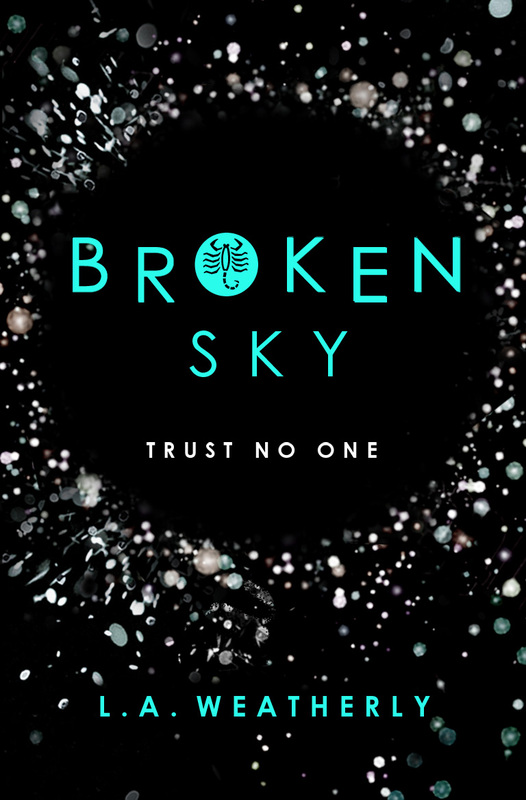 From the bestselling author of the Angel trilogy comes Broken Sky, an exhilarating epic set in a daring and distorted echo of 1940s America and first in a new trilogy. Broken Sky is said to be set within a distorted echo of America in the forties. What was the inspiration behind the setting and what research if any, did you compile to create your world building? It’s funny, sometimes everything starts with a single detail. With Broken Sky, I knew that the planes my characters flew – the fictional Firedoves – were really Spitfires in disguise. Using such an iconic WWII plane immediately gave me a whole feel, an era: fedora hats and seamed stockings and big band music. Awesome! For the flying research, I read memoirs by Spitfire pilots, spoke to Spitfire experts, and even got to fly in a Spit (amazing but scary – and yes, we did barrel rolls, etc!). For the 1940s era itself, in a way I’d already been researching that for years. I’m a huge fan of old movies, and love film noir in particular. In the movie version that takes place in my head, Broken Sky is very film noir! Your main character Amity is a pilot, a female thriving in what is generally seen as a male dominated position. Why do we need characters like Amity in young adult fiction who defy the trend and are strong, young women? And what was the inspiration behind her character? Well, not to sound flippant, but I think the answer lies in the question. We need characters in YA fiction who are strong young women because nobody ever questions why we need characters who are strong young men. The fact that our society still considers strong female characters as worthy of comment shows that there’s a need for them. Though who knows; my next heroine might be Amity’s complete opposite, and I think there’s a need for that, too: we should see characters who reflect the whole big, messy, chaotic wealth of human experience, without extrapolating from them that all young women or men are therefore being portrayed as this or that. The problem, of course, comes when you only have weak young women or strong young men in YA fiction, and in that sense I’m pleased if I’m helping to redress the balance. Phew, sorry, got a bit long-winded there! The inspiration for Amity came from the story I wanted to tell. By definition, a good Spitfire pilot has to be brave and skilled and kind of an adrenalin junkie, so those aspects of her personality were in place from the start. And in terms of how she relates to others, I saddled her with some of my own social awkwardness (poor girl!). No one ever gets my jokes, either. Your previous and wildly popular Angel series also defied previous paranormal books in the genre, how did you find the transition between paranormal and dieselpunk and the futuristic feel within a historical world, as with Broken Sky? Oh, I loved it! I greatly enjoyed writing the Angel series, but maintaining story tension was sometimes a challenge with a psychic, half-angel main character who became more powerful with each book. Honestly, I spent half of book 3 thinking of ways to handicap Willow, so that she wouldn’t just overcome every problem instantly! So it was a lot of fun to create a world where the main character doesn’t have any special powers: she’s just a skilled young woman trying to do the best she can. I've read that you've written over fifty books for children and teens. Which has been your favourite release so far and why? It’s always the book I’ve just written. I’ve been lucky enough in my career to only write what I love (and seriously, how lucky is that?!) – and so each time something comes out, it’s what I’m passionately smitten with at the time. Broken Sky does feel very special to me, though. I love it a lot. I absolutely love your Pinterest board depicting scenes from Broken Sky. Do the image collections play a part in your writing process to help you portray the descriptive for your readers? Aw, thank you! I loved creating it. And yes, definitely. The board was private while I was writing Broken Sky, and I updated it often. I also currently have private boards for books 2 and 3. Having all the visuals to hand really helps me to see the book and the characters, and to mentally create a certain mood for the story. What can we find L. A. Weatherly doing when you're not writing? I’m probably over on Etsy, looking for amazing pieces of vintage jewellery that I totally don’t need but MUST have. Shiny, pretty! Etsy is basically a black hole of "ignore my brain and buy everything", haha. Whereas Pinterest is the black hole for procrastination. And ooh, it's really cool that technology is regressing in Broken Sky! I find eBay exactly the same too Alyssa. But it takes a brave woman to take on Etsy and walk away with cash still in your PayPal account. I can't wait to read this and to grab a copy this week! Great interview Kelly! WOW she's written over 50 books, kudos to her! It definitely sounds like an interesting transition and I love her reasoning for including a strong female fighter pilot in her novel. Looking forward to your thoughts! Thanks Jeann. I was blown away by how many she had published too as it's her Angel series that usually gets the most exposure. 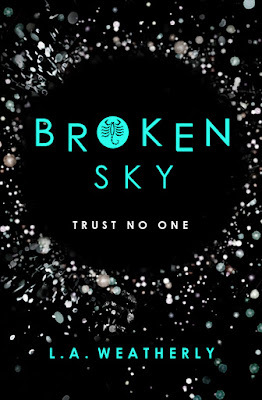 I'm so excited for Broken Sky, those dystopian reads are now so few and far between sadly. I love the sound of your new series, Ms. Weatherly. I'm a fan of your Angel Trilogy, so I'm glad to see you have a new one in the works! Thanks Joy. It really does sound epic, especially with such a strong female protagonist in a male dominated field as well. I'm all about the gutsy female characters this year. Love Etsy; such an addiction place and easy to get lost in! This sounds like a really good book. Love the comments on how we still note strong young females with a bit of awe and how that shows we STILL need to keep including them. It's interesting to think about and so true. It really is Lauren. We love them in young adult and no matter how much out characters evolve, it's important for authors to show strength in many forms too, even a quiet determination and soldier on attitude. I cannot wait to read this one!